The banks of the title are not of the financial variety, you may be glad to hear. This page could also be titled ‘Please do not climb on the banks’, because really you shouldn’t. I shouldn’t have done so either, but I did, in order to see and record ‘one of the most interesting and impressive views in York’, pictured here. I’ve been looking at the documents connected with the plans for 1-9 St Leonard’s Place, which include a letter from Peter Goodchild, of nearby King’s Manor. It suggests that the redevelopment should include an opening up of the area behind St Leonard’s Place and the library, where there’s the Anglian Tower (which apparently isn’t ‘Anglian’ at all) and a series of banks, labelled as being from different periods. It is, as he notes, a dead end. But climbing to the top of the earthen banks gives access to ‘one of the most interesting and impressive views in York’. One which I haven’t seen, I thought, reaching for my camera. It continues: ‘there is no indication or sign to say that it is there, and probably very few people ever go up it to see the view.’ Whereupon I wanted to be one of the few, and got suitable footwear, and headed off for the banks. 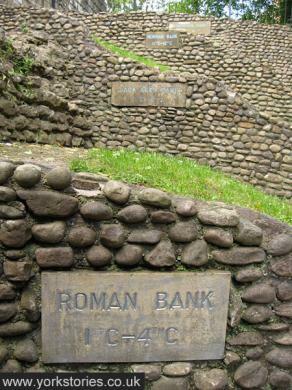 This is probably why few people go up there – because a stone inscription tells us not to. Clearly I’m a very law-abiding person and so on previous visits here I’ve done what it said. But Peter Goodchild is right. From the top of the banks – as pictured above – you can get a far better sense of all those levels the signs below try so hard to represent. I’ve never understood it properly, and still don’t, but from the top of the banks it’s clearer, the layers of it. Climbing down again I almost ended up at the bottom of the banks more quickly than I intended – it was muddy and slippery. 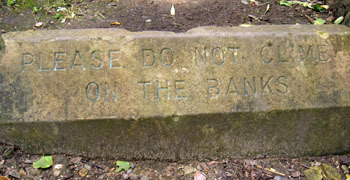 For this reason, and because the sign forbids it, I don’t advocate climbing up the banks. But perhaps Mr Goodchild’s suggestion will be implemented, allowing everyone easier access. 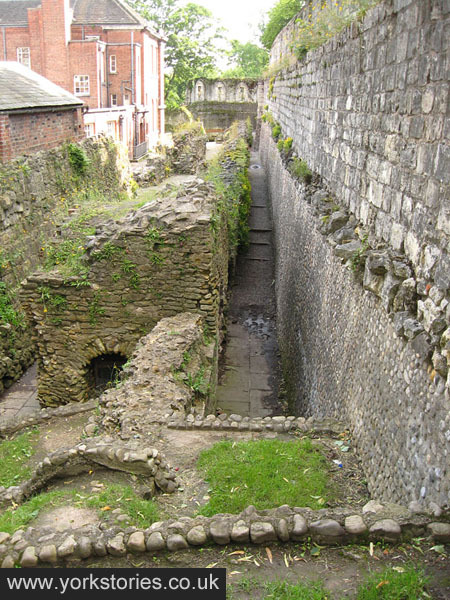 one of my favourite spots in York this… and it really should be made more accessible for everyone, the sense of history, the passage of time, is tangible around here.. This was very very interesting! The photo of the banks shows how much a “public interest” the area is and how it is right to allow future planned access. Progress? ?